Accounting is a critical aspect in your firm. If you have a question or an issue then you want help and you need it now. You do not want to access self-service portals or send emails to general support inquiries. You need to call or contact someone directly. Why choosing us for your QuickBooks support. This is what we offer, instant access to a support person either by phone, on-line chat and occasionally by email. You have a problem? then give us a call or chat on-line. If required, the support representative will ask you to grand him access to your screen via TeamViewer and help you further, that simple but so much effective. We have the experience and the well trained personnel to offer you high quality QuickBooks support whenever you needed it. 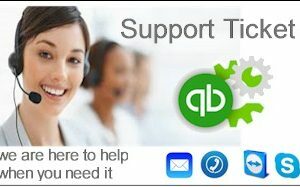 We strongly believe in after sales support and QuickBooks support plans are here to help you. The following describes the QuickBooks Annual or Monthly Support Agreement provided by MULTICLICK.NET LTD to clients who have purchased and paid for this support service. MULTICLICK.NET LTD reserves the right to refuse the provision of support at any time if the service is not paid. Monthly support is provided as a service for as long as the subscription continues.